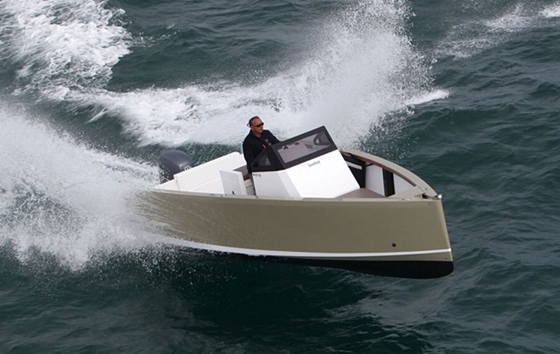 A radical hull shape, easily driven, means both fun and fuel savings. Naval architects Marc Van Peteghem and Vincent Lauriot Prevost are known for designing fast sailboats – particularly large, high-performance multihulls sent out to break world speed records and conquer the America’s Cup. VPLP, as the design firm is called, has not done a lot of work in the small monohull world, but the new runabout they’ve recently designed, the Smartboat 23, is reminiscent of another French-pioneered design, the 6.5-meter mini-transatlantic sailboats in which sleep-deprived sailors skim across big sections of the globe alone and at breakneck speeds. The fuel-efficient Smartboat combines fine lines and light weight with a water ballast system that can add stability and damping. 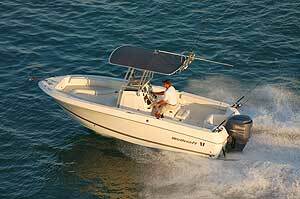 But the Smartboat is a family runabout, or maybe a tender for a yacht. Or a ski boat. Or fishing boat. Let’s call it a boat of adaptable potential. In any case, it’s an ingenious, original project, and a real head-turner. The hull is lightweight, with a sharp entry forward that merges quickly into a modified-V shape, then flattens and widens radically aft to a beam of over eight feet at the transom. In an overhead view the boat looks like a wedge, but it’s an air-wedge only -- the shallow hull has chines at the waterline and a water-ballast system that can add and subtract (by pump) up to 66 gallons of water. 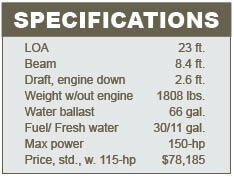 At 8.3 pounds per gallon, that’s a lot of optional stability and damping power placed low and amidships. 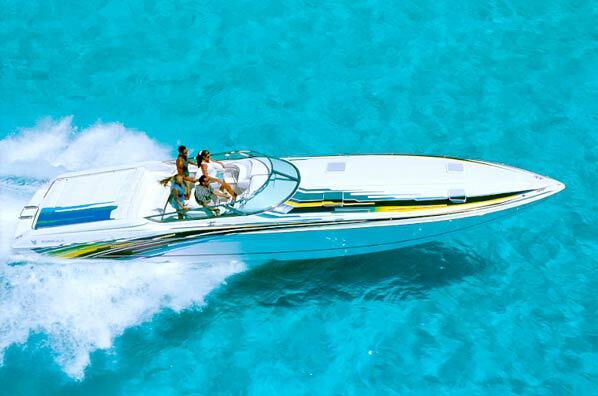 Recommended power is a 115-hp Yanmar four-stroke, with a maximum of 150 hp. 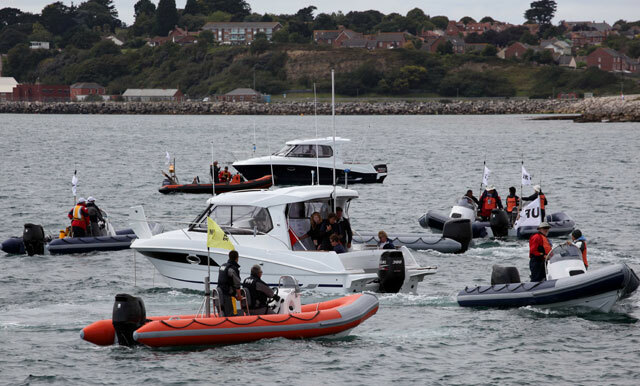 The boat can also be powered by smaller twin outboards or an I/O. 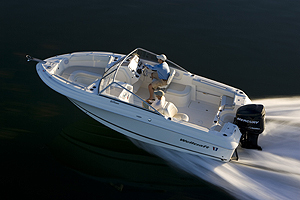 The boat is designed to be run with either I/O or outboard power. Outboard is the way to go, for simplicity and space reasons. The recommended setup is a 115-hp Yamaha four-stroke, although max is 150-hp -- and the transom is wide enough for twin 60s. The hull without engine or water ballast weighs only 1808 pounds. 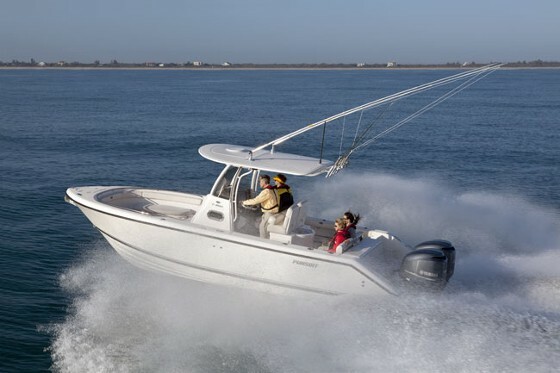 Light construction, combined with an easily driven hull form, means speed and fuel efficiency, especially when combined with modern four-stroke technology. Other design features include a dedicated anchor locker at the prow, a swim ladder integrated into the transom, and a small cuddy cabin accessible through the console, with a crawl-in double berth. There’s even an 11-gallon freshwater tank. 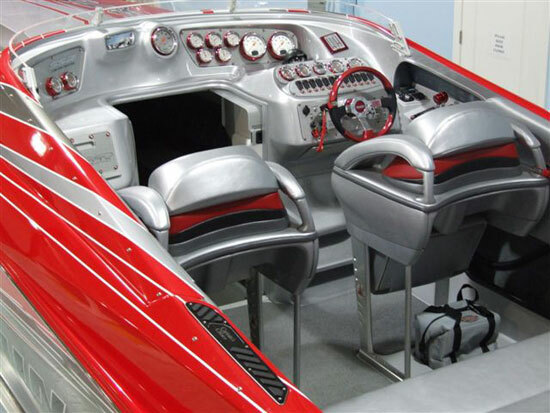 Head and holding tank are optional, as are a number of other niceties like a ski pylon, awnings, cushion combinations, a helm seat/bolster that can be equipped with refrigeration, and teak decking. The standard package with the Yamaha 115 will run about $78,000. The Smartboat is built in Tunisia and shipped worldwide. It’s an interesting, adaptable design with a lot of intelligent features and a blue-water performance heritage. 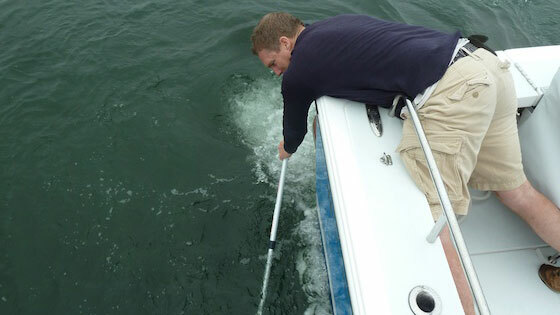 For details, visit Smartboat. 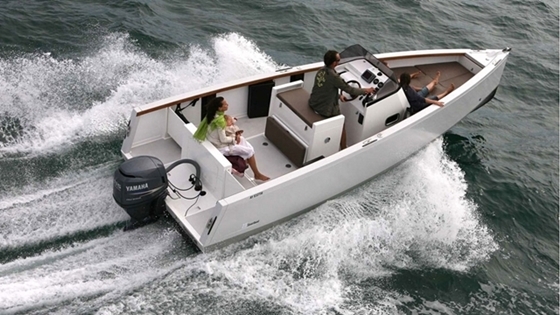 In the U.S. the boat is represented by Eastern Yacht Sales in Hingham, Mass. Contact sean.willis@smartboatamerica.com for more information.